For all the battering and criticism that Japan has to endure for being the largest consumer of fish in the World (which is not. Spain is the largest fish single-country consumer, and Europe eats 40% of the World total catch, and throws away more than 5 times the same amount of dead fish back into the sea. ), it is way ahead of eveyone else when it comes to preserving and repleneshing fish stocks. I’m proud to say that Shizuoka Prefecture happens to be the most active region in this country in that particular field. I’d certainly love to take some “people” to the Tokai Marine University Research Laboratories in Shimizu Ku, Shizuoka City! 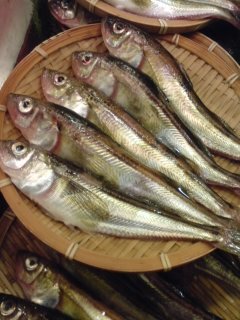 Did you know that Shizuoka Prefecture alone produces half of dried fish in Japan, including the most expensive such as “kinmeidai”, which can easily fetch over 50 US$ a piece, depending on the weight? New Yorkers (Courtesy of Chuckeats.com) and Gastronomes all over the world, rejoice! For the first time ever in Japan, “Kue” (Kelp Bass, Kelp Grouper, Saladfish, Epinephelus bruneus Bloch), a fish costing more than 10,000 yen (100 US $) per kilog, has been successfully bred in Omaezaki, in Western Shizuoka Prefecture! 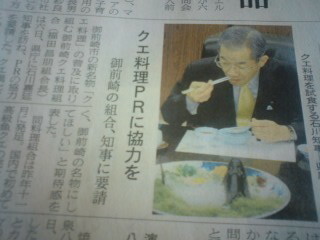 Yesterday Governor Ishikawa (lucky one!) was offered kue sashimi and nabe yesterday by the Kue Promotion Association in Omaezaki (see pic above). About time permanent expats were allowed to run for local offices! Discover the Winter Fish Markets! 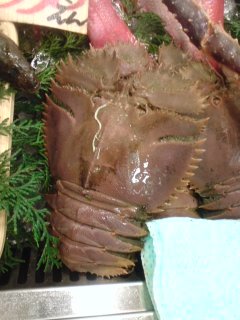 Now is a great time to vist the marine products stands at Fresh Market inside Parche-Shizuoka JR Station! Let’s look around and see if you recognize all those creatures! 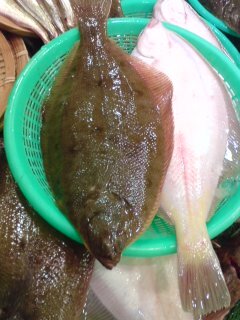 “Mako Garei”, a local Halibut/Turbot variety. Popular in any part of the World! “Hata hata” or “Sailfin Sandfish”. Typical of Shizuoka Prefecture. Great served grilled! “Managatsuo”. Nothing to do with Bonito. Local white-flesh fish, great both as sasimi and grilled! 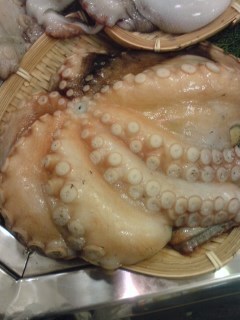 “Tako” or Octopus. Can be enjoyed, raw, cooked, or pickled. Or in Italina cuisine! “Uchiwa Ebi”. Goes by the Latin name of “Ibacus ciliatus”. In Japanese means “Fan Prawn”. 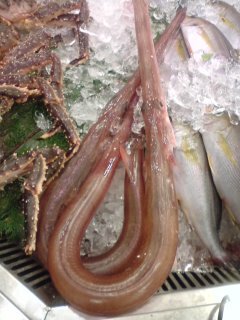 Very popular as sashimi or pickled! 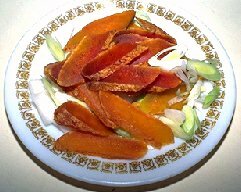 Karasumi, known as “boutargue” in French, or as “btarga” in Italian, is the dried roe pouches of the mullet. It is a quite expensive morsel in Japanese cuisine as well as in Europe (that is the real one!). Numazu City is quite renown for its karasumi, and fishermen have just started drying them under the sun, after getting rid of blood vesels, carefully cleaned them and sprinkled them with salt. 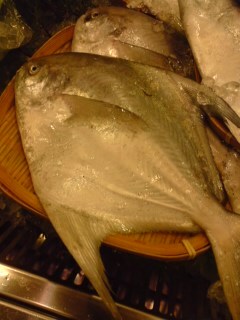 They are served thinly cut as they are in Japanese restaurants. You can expect good sushi restaurants to serve them as starters on their own. This year’s catch was only one fourth of the usual expectation, so brace yourselves when you open your purse! 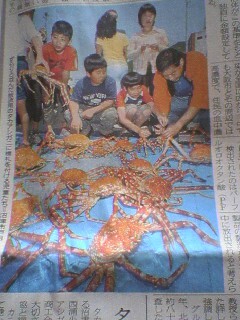 “Taka Ashi Gani” (“Tall Leg Crab”), the largest crab in the world found in Suruga Bay, notably off the northwestern part of Izu peninsula has significantly in numbers in recent years. Fishermen realized they were catching to many young specimen in the deep sea nets. They decided to preserve the caught crabs and with the help of Heda Marine Association taught local children about the importance to preserve marine resources and replenish existing stocks when they show the crabs to the kids every year before releasing them back to depths of 500 metres about one kilometre off Heda Harbour. 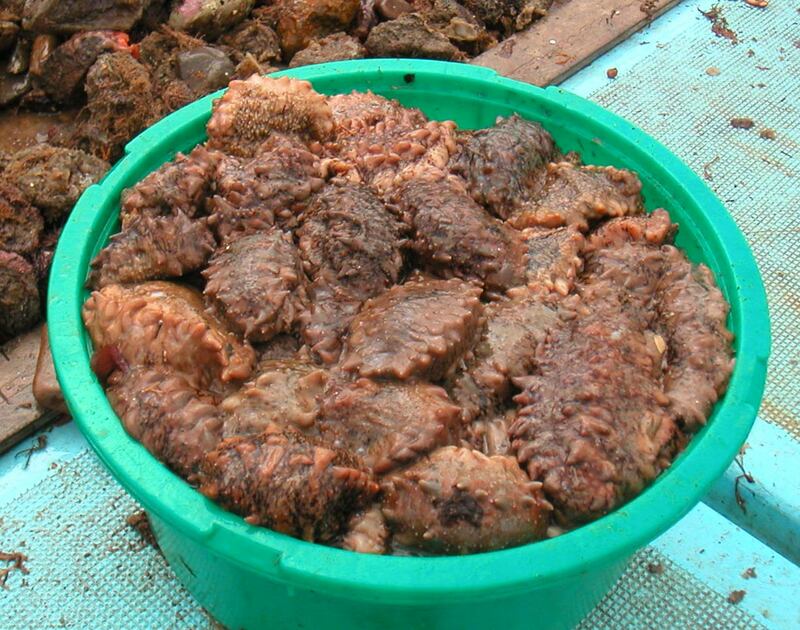 Poachers have increasingly caught “uni” (sea urchins) and “namko” (Sea slug/beche de mer) and the Japanese had to take drastic measures with boat confiscations, heavy fines (between 100,000 yen and 2,000,000 yen) and even prison sentences. Sea urchins will find high prices on the Japanese markets while China and Hong Kong have an unquenchable craving for sea slugs. Both command higher and higher prices, due to the decreasing catches and measures to preserve stocks. As an indication, illegal poaching cases increased from over 900 in 2002 to more than 1,200 in 2004 and still on the way up! On the other hand the legal export of sea slugs has increased by 43.5 % from 2004 to 2005 to reach 7,900,000,000 yen in sales of which China’s share amounts to 520,000,000 yen, an increase of 60% in one single year. The total illegal catch was 32 tonnes last year in Hokkaido.